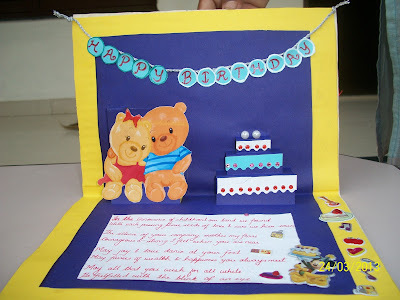 I had been toying around with the idea for making a pop up card since days. But was not able to come up with an appropriate idea. Just recently a colleague of mine asked me to make a birthday card for her best friend and i thought why not to give pop up card a try!!! When i think of pop up cards, the first name that comes to my mind is Dr Sonia. Browsing through her blog i came across a fab tutorial of cake pop up card and thought of giving it a shot!! The link to Dr. Sonia's tutorial is here. 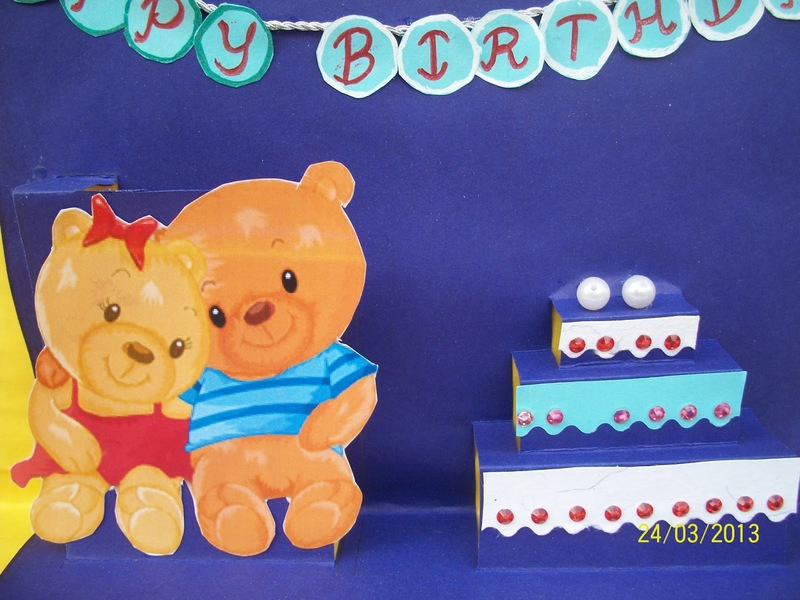 Its said that the front of a pop up card should be kept simple. So I just used 2 candles, some ribbons and a sweet image to embellish the front. This is the inside of the card. I wanted to give it a party look. Hence added the "Happy Birthday" on a silver twine. I wanted to try 2 pop ups. Hence added a cake pop up and another simple pop up that shows 2 teddy friends!! 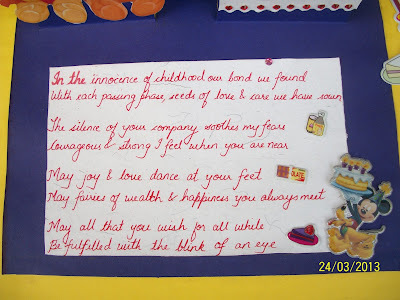 And since all my cards always have a poem, added few words to complete my card!!! Please do leave back your valuable comments!! I'm so glad you decided to plunge in and make this terrific pop-up card! I love the bright colours you have sued, and it has given me some inspiration to make my grandson's first birthday card! Thanks for sharing this with us at Opus Gluei, I feel we're as blessed as the lucky one who receives this fun card!! Thank you so much Electra.....am the one who's glad to be a part of your challenge!!! 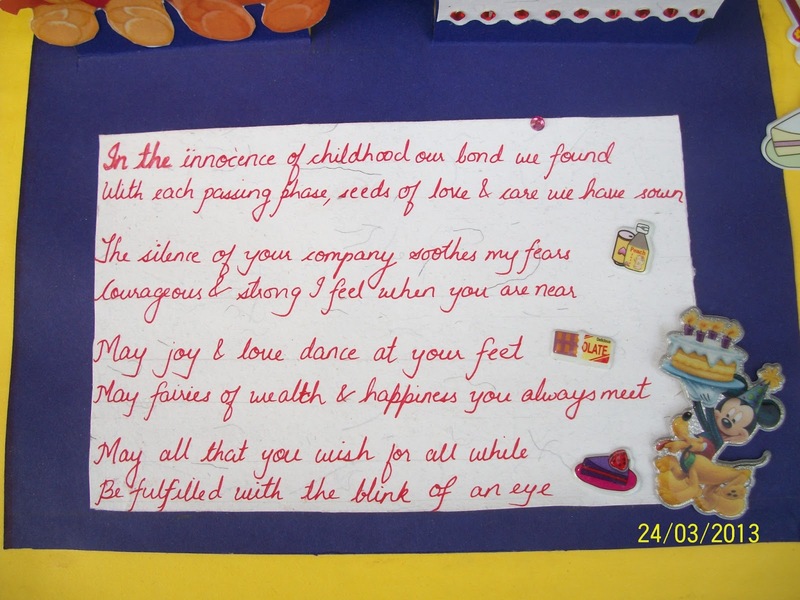 Fantastic card for a child Bijal. 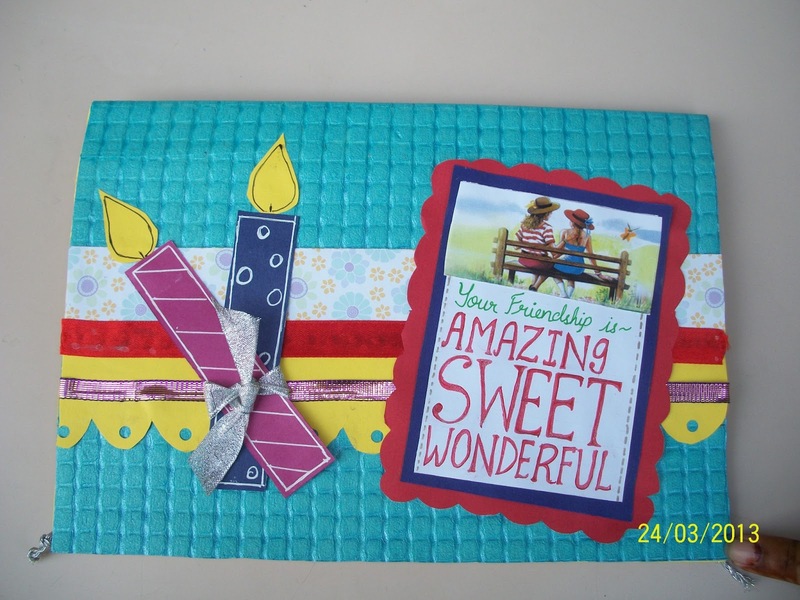 Love the cute image inside and the lovely bright colours. Thanks for joining us at TG this week. What a darling card, full of happiness, bright colors, and darling images! I love it, and well done with your first pop up! This is just what we were hoping to inspire with our Opus Gluei theme. I'm delighted you had fun with it and thank you for playing with us, I hope we get you back for more challenges!